On this page you can download SiDiary 6 compatible AddIn modules (the content will be updated contineously). All AddIn-Dowbloads are Zip-Files. Right-Click on the link, save the Zip-File to your computer and unzip the file to SiDiary's subfolder 'AddIns'. Then start AddInSetup.exe in the same folder. With our appropriate AddIn it is possible to transfer the data directly from SiDiary to Microsoft® HealthVault® and make data from your blood glucose meters (more than 150 meters integrated right now), insulin pumps etc. availabe in your personal healthcare records. HealthVault® is a web-based platform from Microsoft to store and maintain health and fitness information. With applications like SiDiary HealthVault® supports users with their personal health management and in collaboration with physicians and other stakeholders in health care. User of a CGMS (like Freestyle Navigator or Dexcom Seven Plus) has asked us if it could be possible to get single values from their CGMS datatype automatically written in their logbook. With this AddIn it's possible now. Install it like described above, then activate it in the menu 'Extras ->AddIns' and start it in the menu 'Edit ->CGMS'. Now you can select the time range, from which the values should be extracted and the criteria for the extracting procedure. 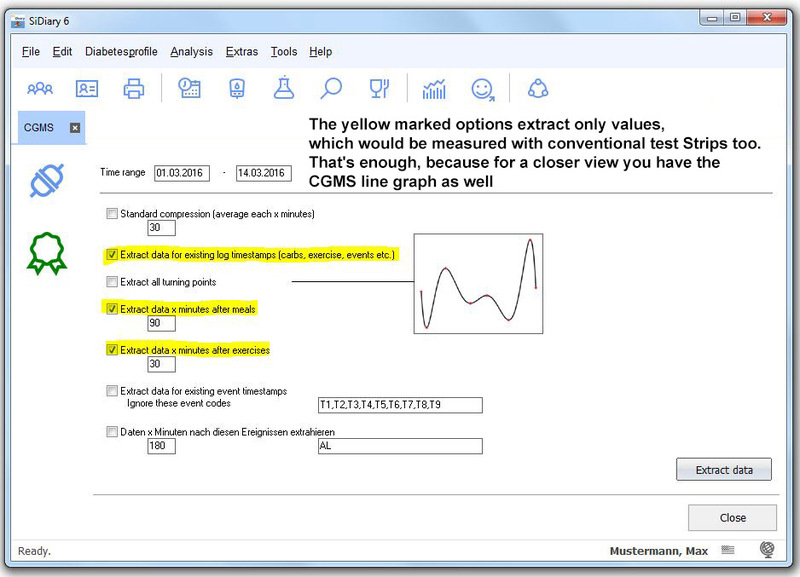 Then click on 'Extract data' and you will find the values in your detail logbook. Since version 6.1.1304 this AddIn is included already in the program itself and can be activated in the menu 'Extras -> AddIns'. Then you can find it in the menu 'Edit'. If you want to see on the first sight what's going on with your bloodsugar then just download this free AddIn to enhance your statistic section. You will see your average BG of the chosen time range as well as the standard deviation in a visualized way. Also we have implemented a standard week, whch means all BG measurements of the chosen time range are projected on the seven weekdays. The AddIn will how the most recent news from the SiDIary webiste as a program message within the notification area. 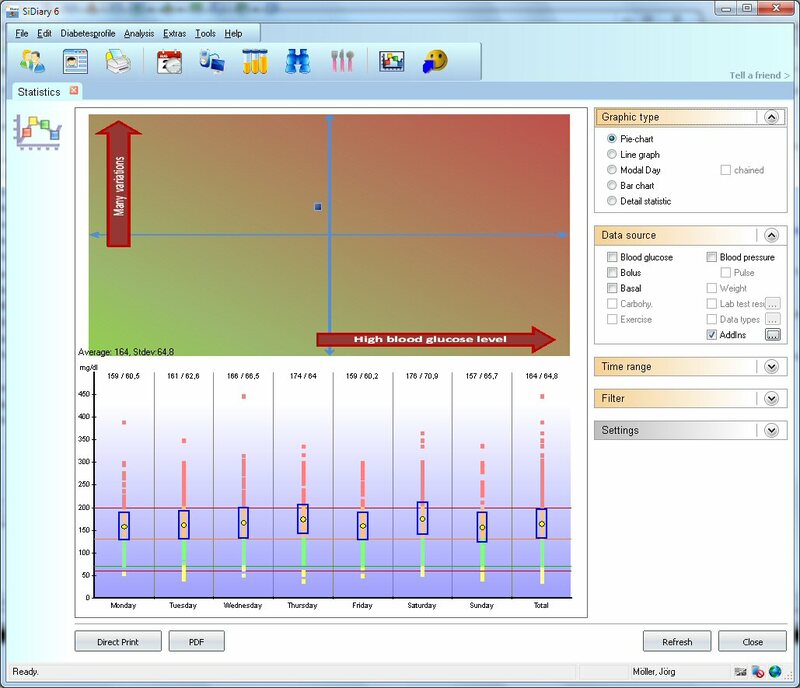 The AddIn will calculate the average steps for all data available in an user defined datatype "steps" and show you with SiDiary's trend analysis if you have reached your targets. 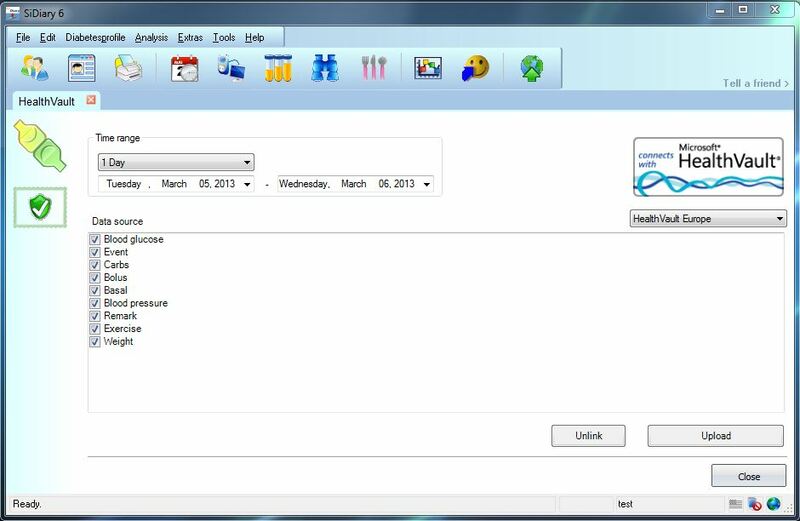 By using this AddIn you are able to create event records for your log-book with an editable search term. Now you can use those events as filters within the statistics. Example1: The data download of your insulin pump is creating remarks like "Bolus cancelled". Simply use this term to make real SiDiary events from. Example2: If your logbook contains remarks like "ill" you can make events from that occurrences and then view a statistic of your blood glucose levels on days when you were ill.
With this AddIn you can calculate your personal BDI which is more reliable than the BMI because the BDI is including the waist circumference. Imagine two people, both of identical height and weight, one bodybuilder and another overweighted man. Both would have the same BMI but a completely different BDI.